There was about a month a while back where I kept seeing stuff about cults everywhere. Jim Jone’s little misadventure always comes up since it was such a massive failure with such horrible consequences. Listening to him talk I can’t understand how people weren’t able to see how douchecrazy he was. I like how Mike is approaching this. Reggie is so dense it may not work, but I’m giving Mike credit for trying. Reggie is kinda of a pain in the nether places. I stick with Mike this one, go Mike! 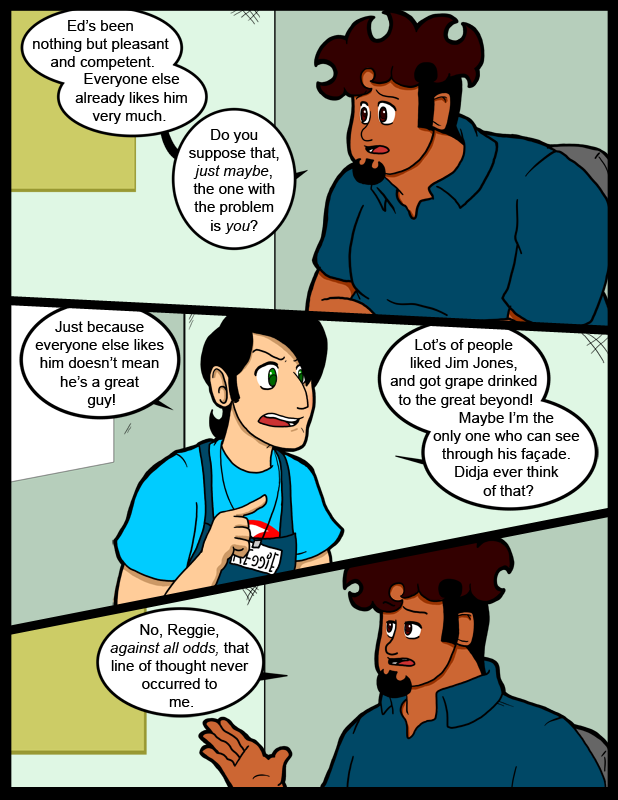 I still think Reggie just needs a big hug, a smile, and someone whom actually wants him to feel genuine happiness instead of his half-assed attempt at it by being a spoiled snob who looks down on others to make himself feel important. Overblown self-importance is not happiness, Reggie. Reggie just needs a girlfriend (or boyfriend, you never know). An angry man who was made happy by eating the first bran flakes? What a cheap origin for such an awesome sobriquet. I looked into “Sunny Jim” just a little bit and I can see why you forgot about it. There was the Force cereal mascot, then the peanut butter mascot, and random people who got that nickname.